"You learn at an early age," one man told National Geographic, "that in many instances absolutely nobody believes what the government is saying. At a political meeting a party member will talk. He'll know what he's saying is nonsense. And he'll know that you know." In the old days Chinese were indoctrinated to believe they were better off than people elsewhere in the world and they believed this because there was little evidence to contradict it because Chinese had little exposure to the outside world through the media. Life was also shaped by social obligations. Many people have bad memories of working for voluntary work patrols in which they were forced to participate. Students and soldiers helped in harvest. In some places, one day every year people helped sweep up the city for no money. Neighborhoods are kept in line with “building bosses” and their helpers, “door watchers,” who keep an eye on what is going on in almost every house. Informers are everywhere. 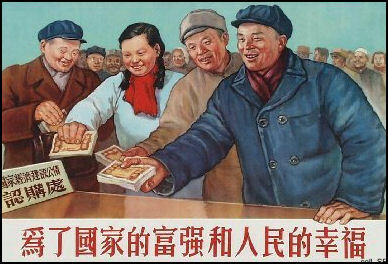 Communist-era proverb: "One Chinese watches a thousand; a thousand Chinese watch one." Most Chinese also have had to answer to "community units" or "work units" (dawei) in their place of work, whether it be a factory, hospital, commune or public works project. In the old days, these organizations exerted control on almost every aspect of an individual's life: they gave out ration cards, arranged day care, supplied train tickets, chose which doctors and hospitals people wented to, decided who gets housing, set salaries and recruited party members. The lives of some people are still controlled by work units but not as many as before. 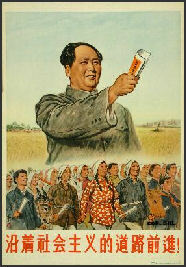 Work units have been the main channels in Communist China for distributing social benefits and exerting social control. Even today they keep files on their members and often have to be consulted about personal matters such as travel or children, and are able to pressure people by reducing wages and bonuses, by denying promotions and transfers, or by taking away the job completely. In the Mao era, people lived in assigned housing in state dormitories, communes and factory quarters and bought food and clothing with rationed coupons. Chinese society demands much less conformity in political views and personal lifestyles than it used to, especially in the Mao era. One of thee biggest changes had been the gradual erosion of the population registration system, which tied people to their places of birth, preventing internal migration and even tourism. Neighborhood committees and work units no longer exert the control on people's lives they once did. Their powers began to diminish in the 1980s in rural areas with the rapid collapse of communes and the giving of land and decision-making power to farmers. Work units began collapsing in the cities in the 1990s as state-owned industries began going bankrupt or were shut down or restructured. There are still an estimated 500,000 neighborhood committee cadres. The leaders are paid around $250 a month. These days their duties include helping the unemployed find jobs, organizing anti-crime efforts, keeping track of childbearing women, and helping married couples stay together. 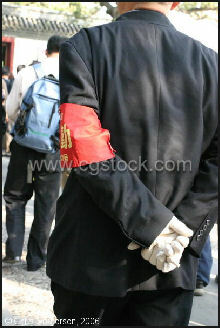 From time to time, the leaders are called on to do things like count Falun Gong members. There is now some discussion about making the neighborhood committees small welfare agencies and hiring college graduates instead of retired women. In the late 1990s, the government under Jiang Zemin launched a “spiritual Civilization” campaign in which people were encouraged to be more cultured and shed their bad habits. Described by Steven Mufson in the Washington Post as "one part Leninist ideology, one part Miss Manners," it covered everything from spiting in public to reuniting the motherland and advised people to pay their taxes, avoid too much raw or cold foods, take frequent showers, cut one’s fingernails and perform good deeds. As part the campaign the airwaves were filled with moralizing lectures; billboards listed the "Nine Commandments" beginning with "Love Your Country"; husbands were told to help around the house; and children were told cook "soft and mushy" meals for their elders. Some places even banned swearing and impolite behavior and created "civilized citizen" pledges. Shanghai launched a "Seven Nos" campaign (no spitting, no jaywalking, no cursing, no destruction of greenery, no vandalism, no littering and no smoking). An effort was also made to clean up the city's public toilets. Businessmen encouraged their employees not to use phrases such as "Don't have it," "Can't you see I'm busy," and "Hurry up and pay." In Dalian, citizens were promised cash rewards for reporting rude taxi drivers; travelers were fined for spitting; scavengers were banned from bagging doves and pigeons in the central squares; and soccer fans were told to tone down their insults of players on opposing teams. As part of the "One Million Party Members Care" campaign a hotline was set up in Beijing for complaints of sloppy house repairs, sanitation problems, shoddy goods and problems with urban life. 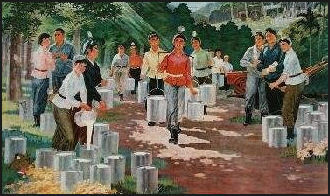 The "spiritual civilization" campaign also honored "everyday heros” and “model citizens” such as Xu Hu, a Shanghai plumber who fixed leaky toilets for free; Li Guon, a well-driller who helped poor villages in the Gobi Desert find water; and Li Suli, a bus conductor who arrived early to work to wash her bus and charmed passengers with her smiles and friendly advice. Other model citizens included a cancer patient who got out of bed the day after an operation an swept all the floors in the hospital, and a bank manager who helped monks at a temple load 10 tons of coins on a truck and take it a bank where the monks opening a high-interest account. Jiang also stressed guoqing ("Chinese-ness) and launched a "Three Stresses" campaign: highlighting a need for theoretical study, political awareness and good conduct. The program was criticized as a waist of time and energy. Hu made “building a harmonious society”---a reference to spreading the wealth from the haves to have nots and correcting the injustices of Chinese society and combating widespread corruption---a top priority. How serious and successful he is has not yet been determined. In the hinterlands the Communist Party has done little to respond to injustices (See Protests and Demonstrations, Government). Speeches by party leaders emphasize unity and harmony but in society there is more individuality and personal freedom because people have more money and more options than they used to. Many are not exactly sure what all this means but some think it is a green light to some forms of dissent that allow citizens to let off steam. The Hu government has held public hearings on some controversial matters, allowed more freedom of the press and expression on the Internet and refused to wield a heavy hand when protests break out in part to let people vent their frustrations while the government maintains a firm grip on power. In step with his plan to make China a more harmonious place and combat greed and corruption. Hu issued “Eight Virtues and Eight Shames”: 1) Love the motherland, do not harm it; 2) Serve don’t deserve people; 3) Uphold science, don’t be ignorant and unenlightened; 4) Work hard, don’t be lazy; 5) Be united and help each other, don’t benefit at the expense of others; 6) Be honest, not profit-mongering; 7) Be disciplined and law-abiding, not chaotic and lawless; 8) Know plain living and hard struggle, do not wallow in luxuries.” The message has been placed on billboards, featured on the front pages of newspapers and repeated over and over on television and radio. Developing world counties are generally two-tiered societies with a large, poor underclass and a small upper class, often connected with the government. The middle class is often small. 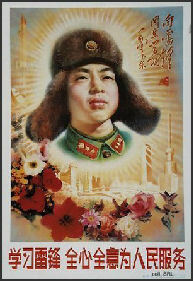 In the Mao era there was little income disparity and few rich people. Forced egalitarianism prevailed. The Asian countries in with the lowest income disparity between rich and poor (determined by how many times more income the richest 20 percent of the population has than the poorest 20 percent) in the 1990s were: 1) Sri Lanka (4.4); 2) Indonesia (4.9); 3) South Korea (5.7); 4) China (6.5), Philippines (7.4)...compared to 9.0 in the U.S., 15.5 in Thailand and 32 in Brazil. As China’s economy has rapidly grown, it has gone from having one of the lowest income disparities of incomes to one of the highest in a relatively short amount of time. According to the National Bureau of Statistics, in the mid 2000s the top 10 percent of the Chinese population controlled 45 percent of the country’s wealth while the poorest 10 percent had 1.4 percent and had incomes less than 1/12th of those of the richest 10 percent. By some accounts the disparity now is greater than it was before the Communists took power in 1949. Income disparity is also geographical phenomena, with people in the richest parts of the country earning 10 times more than those in the poorest parts. Much of the China’s wealth is concentrated in the coastal cities in eastern and southern China. The interior for the most part remains poor. A poll conducted by the Pew Research Center before the 2008 Olympics found that 89 percent of the Chinese interviewed said they were concerned about the gap between rich and poor. Beijing is attempting to tackle the income disparity problem by implementing a more progressive tax system and cutting taxes for the poor while closing loopholes and preventing cheating by the rich. 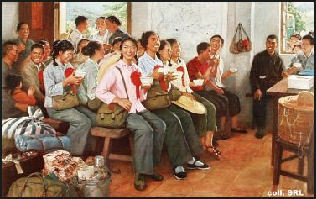 In a New Year speech in 2007, Hu said he was committed ending the gap between the rich and poor. By then there had been a shift in focus in policy with the government saying that it was just as responsible for improving the quality of life as it was for delivering economic growth. In December 2007, the Chinese government announced that it would subsidize the purchase of appliances by farmers to help narrow the income gap. In the first stage of the program farmers in Shandong, Henan and Sichuan Provinces could buy cell phones, televisions and refrigerators, with government footing 13 percent of the bill. In 2007, the Beijing branch of the ACWF renamed the honor the Capital Harmonious Family award to comply with President Hu Jintao’s comprehensive vision for building a harmonious society that promotes economic and social equality. It has been a popular, even iconic competition; the thousands of families who have won it enjoy more prestige and respect from their neighbors. For more than four years, the Beijing ACWF has been working with the Beijing Academy of Social Sciences to establish more “scientific criteria” to evaluate potential families for the award. On March 4, 2008, two separate trial criteria -- one for Beijing's urban middle class, and another for its poorer rural, or suburban, class -- were posted to the Beijing ACWF's website. They generated no heat or interest from the press or the public. That is until Feb. 3, when the Beijing News's Wei Ming reported that the 27 evaluation criteria were close to being finalized. Ninety percent of the criteria for urban families are relatively ordinary, reading in part: “Family status is equal and not affected by differences in age, gender or income; family members are satisfied with their position in the family.” Hardly the stuff that incites Internet flame wars. A poll on Sina Weibo, China's most popular microblog, recorded that 81 percent of the respondents rejected the new criteria entirely. Despite tremendous economic gains over the past 30 years, few Beijing families can afford the cosmopolitan lifestyle the ACWF outlined. Party officials, however, are often perceived as affluent, living beyond the means of those not in, or connected to, government. Li Xu, a Tencent user, expressed the sentiment of many Chinese microbloggers when he wrote: “Everyone, and even every family, has a singular definition of happiness. After all, harmony, in its true state, is a natural thing. Why should it be limited by criteria? Don’t encourage society to despise the poor and curry favor with the rich. Read enough commentary on Tencent and Sina Weibo and two things become very apparent. First, most microbloggers haven’t bothered to read the rest of the selection criteria for urbanites, which largely emphasize inter-family relations and patriotic values. And second, most either haven’t noticed -- or don’t care about -- the separate, condescending evaluation criteria the Beijing ACWF has established for poor families living in Beijing’s rural suburbs. Whereas urbanites are encouraged to have a library of 300 books, suburbanites are merely encouraged to have a study space with an undefined collection of books. While urbanites are encouraged to recycle, suburbanites are encouraged to develop good personal hygiene and avoid letting their dogs and cats run loose. Personal virtue is important to both groups, but whereas urbanites are encouraged to love their neighbors, volunteer and help the elderly, suburbanites are reminded that harmonious families do “not engage in superstitious activities, cults or prostitution, gambling and drug abuse.” Beijing’s urban residents, most of whom live within a brief stroll of opportunities to partake in gambling and prostitution, are not required to meet a similar standard to be judged harmonious. Were such a standard required of them, no doubt online reaction would be strident. But the urban middle class doesn't seem to be offended by the elites' condescension toward the rural Chinese. Data is spotty, but it is estimated that the average income in China's cities, minus the wealthy, is three times higher than income in the countryside. This gap is the most profound gap in contemporary China: Economically and culturally, China’s urban middle class resembles more the elite class than their poor country cousins. So why, then, don’t Beijing’s so-called suburbanites object on their own behalf? Presumably because they belong to that half of China that lacks access to the Internet and other (modest) public means of dissent. But even if they had such access, would China’s upwardly mobile middle class really care to listen and sympathize? Until their voices are heard as clearly as those of middle-class netizens, the silence says as much about the distance between Beijing and the countryside as any data set.